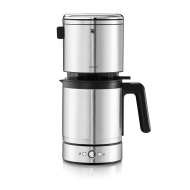 alaTest has collected and analyzed 266 reviews of WMF LONO. The average rating for this product is 4.3/5, compared to an average rating of 4.4/5 for other products in the same category for all reviews. Reviewers really like the price and size. The performance and usability are also appreciated, whereas there are some critical comments about the noise. We analyzed user and expert ratings, product age and more factors. Compared to other products in the same category the WMF LONO is awarded an overall alaScore™ of 89/100 = Very good quality. Toller Tischgrill. Gut zu reinigen und alles gelingt. Wie schon ein Kunde schreibt, Bratwürstchen dauern lange. Fleisch und Geflügel schnell gegrillt und saftig. Schöne Optik und sehr stabil.